Nintendo announces Super NES Classic Edition. 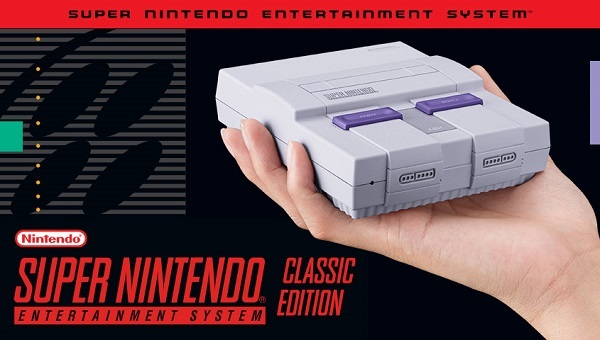 Nintendo today announces Super NES Classic Edition. The Super Nintendo Entertainment System, Nintendo's follow-up console to the legendary Nintendo Entertainment System (NES), launched in 1991 and introduced what many consider some of the greatest video games of all time - classics such as Super Mario World, The Legend of Zelda: A Link to the Past, Super Mario Kart, Super Metroid and F-ZERO. + Secret of Mana, Star Fox, Star Fox 2, Street Fighter II Turbo: Hyper Fighting, Super Castlevania IV, Super Ghouls 'n Ghosts, Super Mario Kart, Super Mario RPG: Legend of the Seven Stars, Super Mario World, Super Metroid, Super Punch-Out!! All of these games would be considered classics by anyone's standards, and some of them in particular - Secret of Mana, Final Fantasy III, EarthBound and Super Mario RPG: Legend of the Seven Stars - are massive role-playing games that can take dozens of hours to complete. Even for super fans who have played all of these games multiple times, the inclusion of the never-before-released Star Fox 2 game will offer them something entirely new to enjoy - if they can unlock it by proving their skills in the original Star Fox game. Supernice news, I have been waiting for this announce for a very long time! By the way now I play in games using snes emulator https://romsmania.com/emulators/super-nintendo that work very reliable and fast, so I can surely recommend it for everyone. How can i avail here in south korea ?